I am constantly surprised by how much of a difference back stitching makes to a piece! I’ll look at a piece before back stitching, and wonder just how something coherent will come out of it! Sometimes I even wonder if I need new glasses, it seems to out of focus! 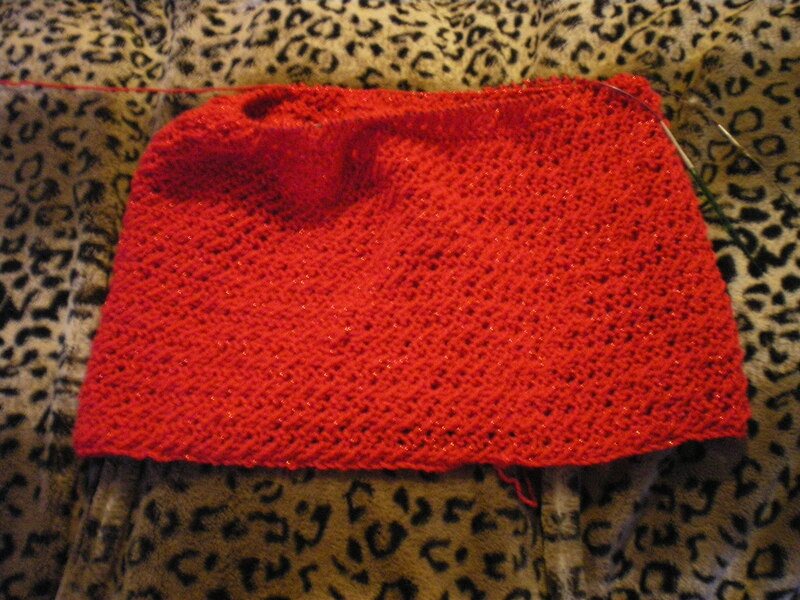 And then, I’ll do the back stitching, and it all comes slowly into focus! 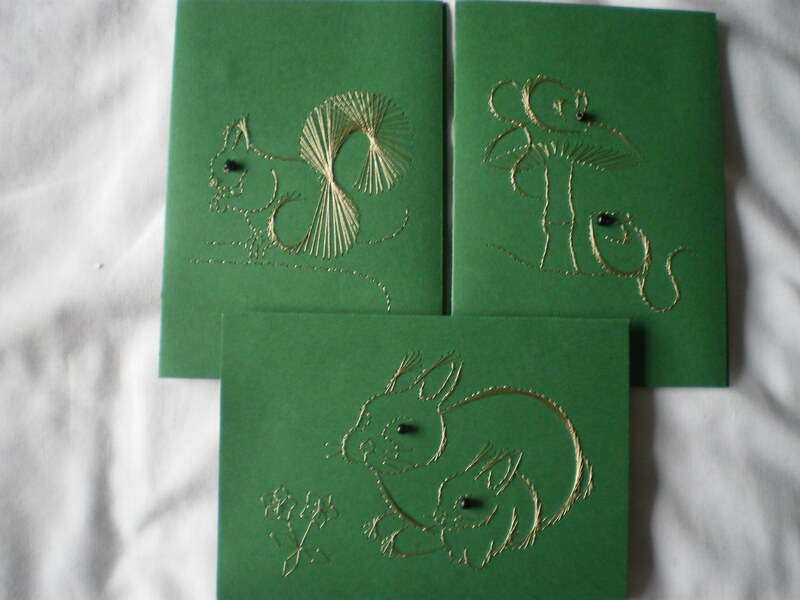 Here are before and after pics of the back stitching for my dad’s card! Tada! I think my dad will like it- he does a lot of gardening with my mum, especially over the summer! A friend of mine commented that I don’t have many pairs of matching socks, so I decided to make the next pair completely matchy-matchy. Therefore, I’m doing them two-at-a-time 🙂 They should be nice when they’re finished, but they’re just started now, and buried somewhere, so I don’t have a photo to show you. 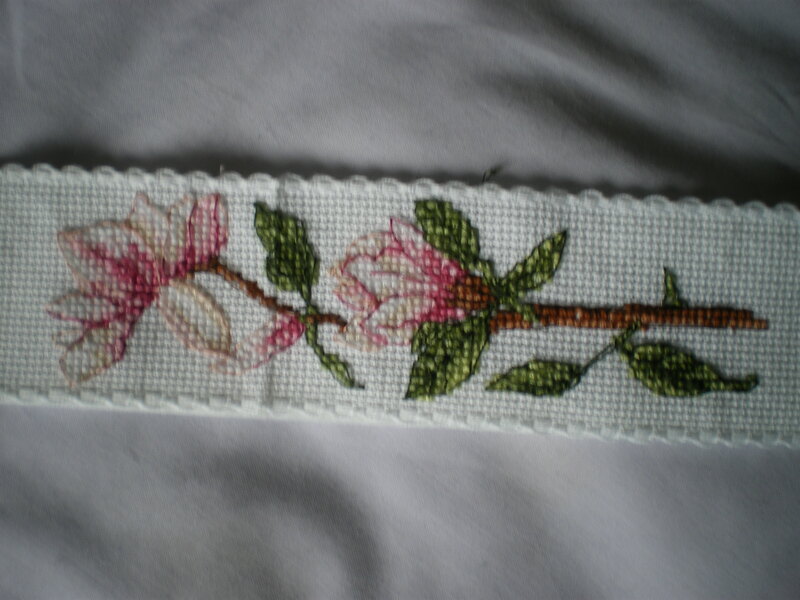 I also wanted to do some cross stitch, but again, everything was wanting me to finish them (does anyone else get this? When I cross stitch, I *have* to be doing it because I like cross stitching, rather than I want the thing finished? 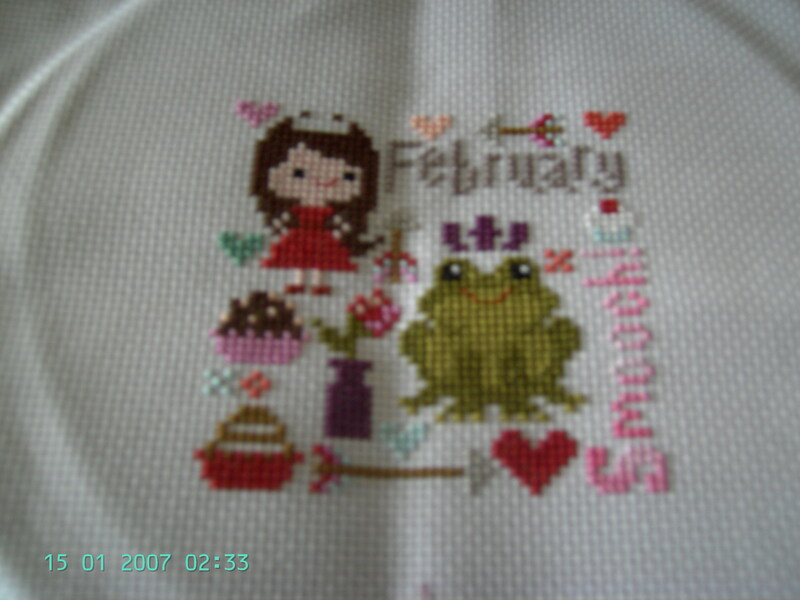 I think it’s because I cross stitch very slowly (in my mind, I don’t know how fast I am in relation to anyone else!)) 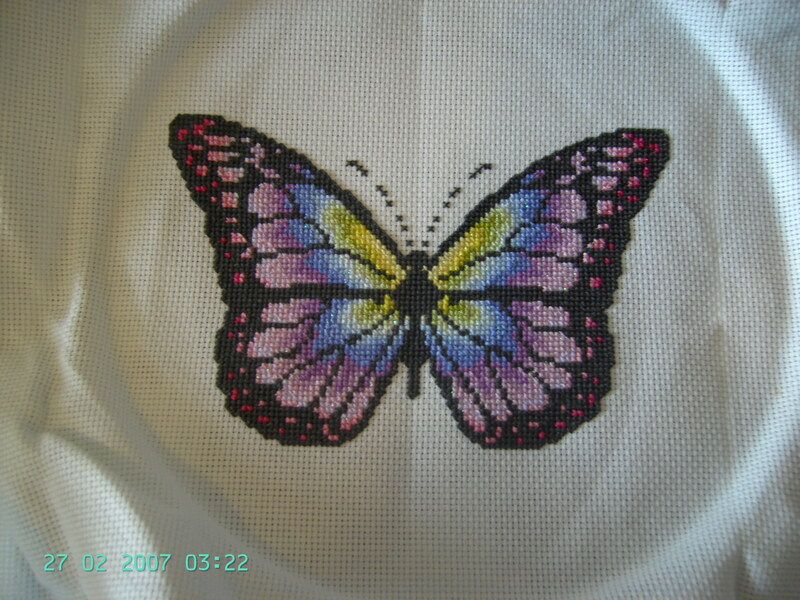 so I pulled out my butterfly from enchanted-needle, and worked on that. Now I have the words, hearts and frame bit left, but I wasn’t in the mood to finish that after all of the changing threads for the main section, so I went back to OUAT. 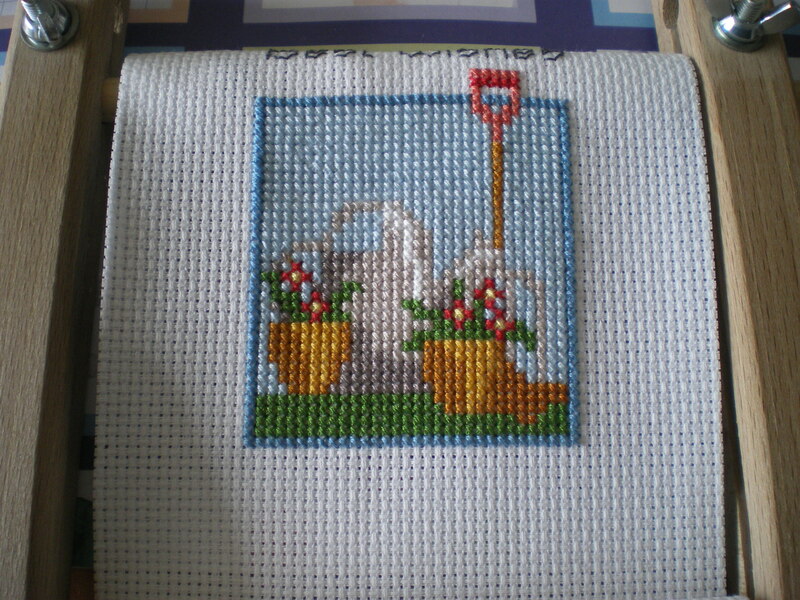 I don’t have a picture of that, but I’ve nearly finished April’s block- hopefully I’ll finish it this weekend, in time for May’s to come out! Having bought (and since started) the Frosted Pumpkin Stitchery year-long Once Upon a Time sampler, obviously I needed to get the threads for it. And some of them needed changing (I want to do a different coloured border, and use variegated threads for some of it), and I wanted to get some more sock yarn (even though there is no way I’m going to run out any time soon…), and then I remembered that I want to make some coasters for my parents, so I thought I might as well get them then as well. So you see, it’s all totally sensible really… but yeah, I just need to get some sock yarn for my dad’s birthday present, and then I really am all set. Well, at least until I finish the next cross stitch project! Given that I’m working on 3, with the Cat Alphabet (and Spirit) in hibernation, I’ve got quite enough to be getting on with, I think. Especially when you add in a sudden birthday on Tuesday which I need to make a card for (it’s too much effort going all the way into town! )This is what I’ll be doing this weekend, in between marking! It’s already coming along really well, I think. Unfortunately, it seems impossible to photograph decently, so you’ll have to wait for that. Hopefully when it’s finished I’ll be able to get the camera to focus on it properly! 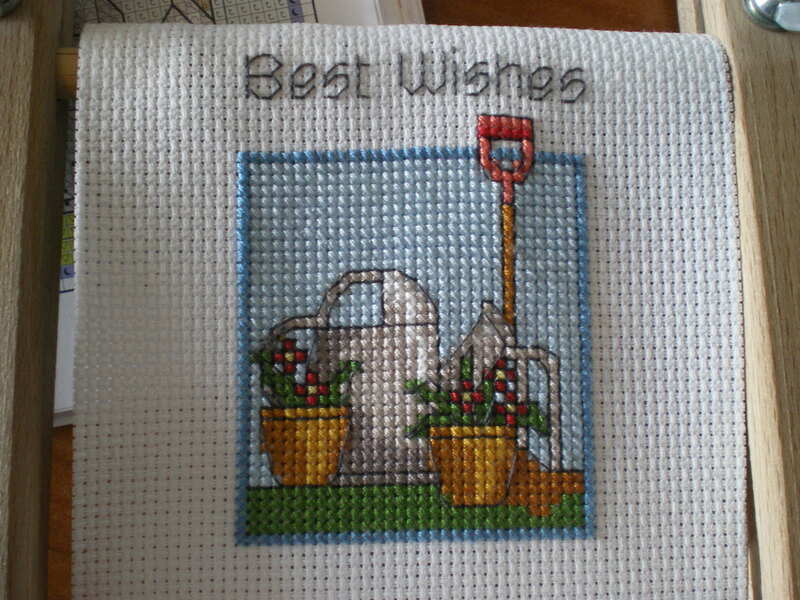 But it hasn’t all been cross stitching (although it does feel like that sometimes!) 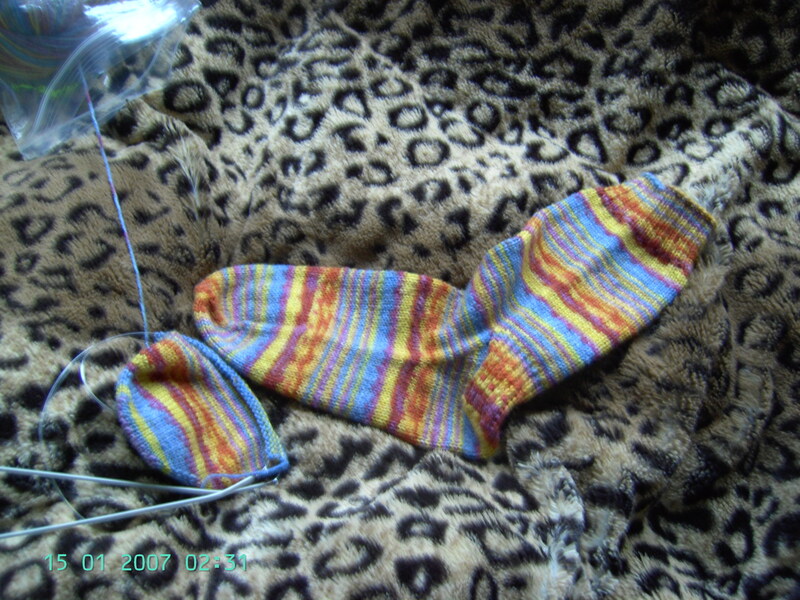 Somehow I’ve managed to fit in enough knitting time to finish the first happy stripy sock, as I’m calling this pair, and start the next! 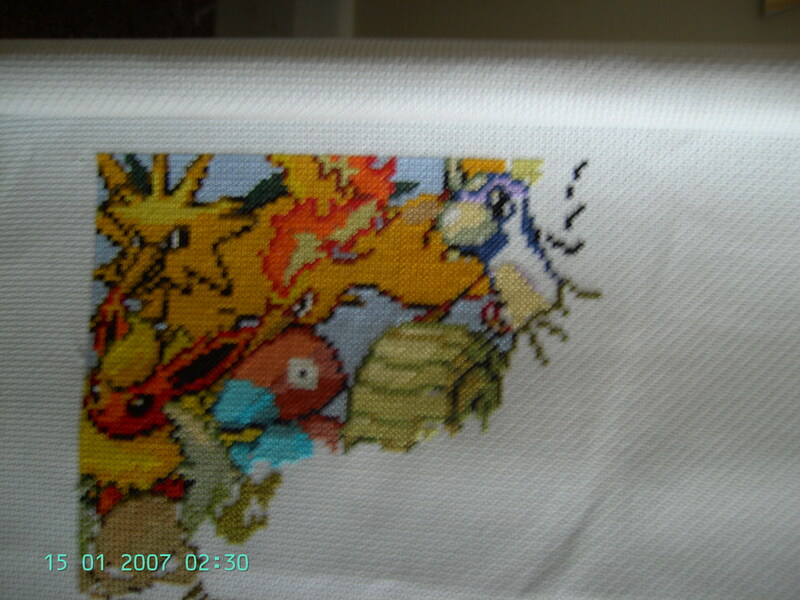 All my housemates are amazed that I’m doing something as large as the pokemon cross stitch I’m doing. They all think it’ll take me in the region of 30 years to finish…given how fast I’m stitching on it, that’s entirely possible! 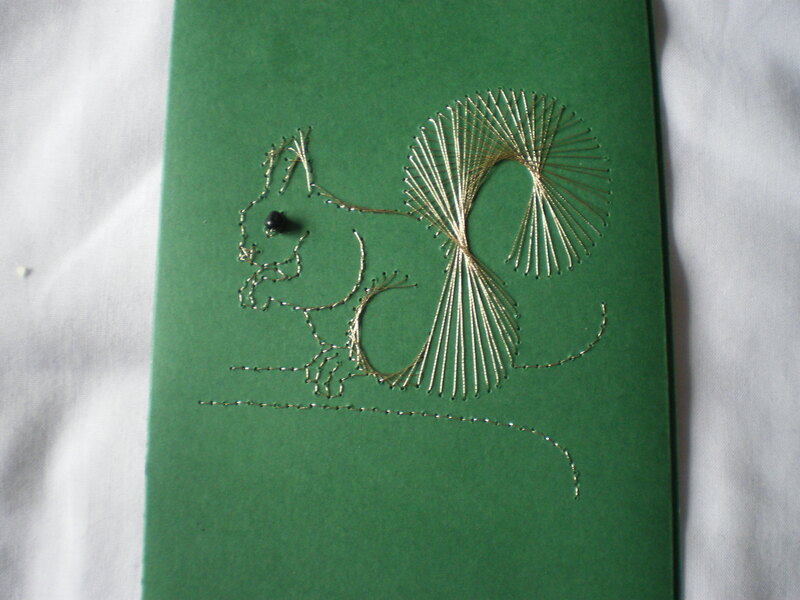 Hopefully I’ll be able to pick it up again, I really like how it’s stitching up, but birthday cards first! Maybe I’ll do a couple more so I have some ready… forward planning is always the way to go! So, how’re all your crafty things coming along? Any last minute emergency things, or is everything plain sailing? Wow, this has been a knitting-heavy week! Well, I have been busy this week. 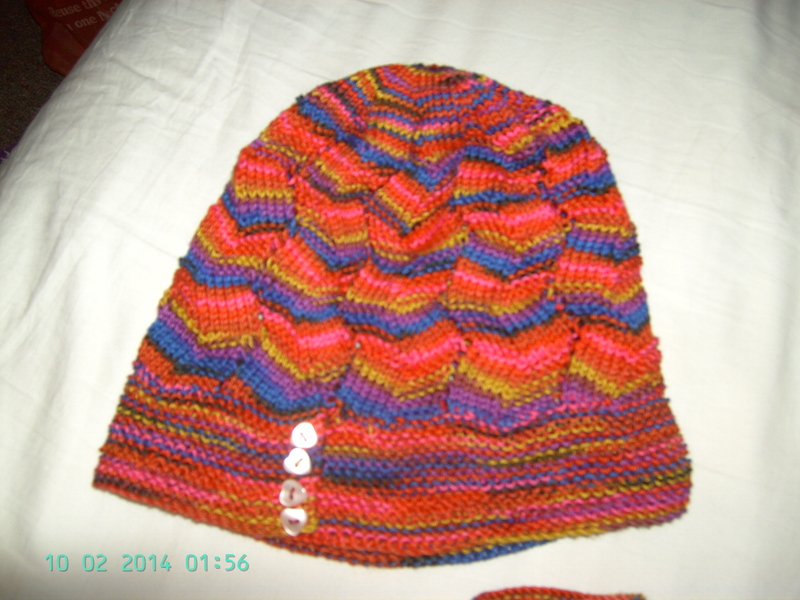 I’ve finished a hat and handwarmer set (available for free on knitty, or ravelry). 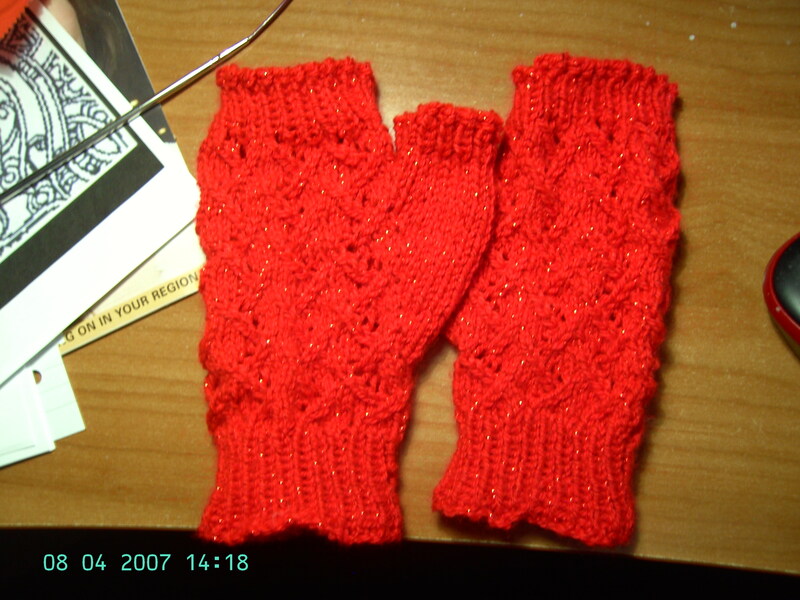 I actually finished them on Wednesday, but the knitting was done by Monday. I just needed to wait to pop into town to look for buttons. I have another 4 of these buttons, which will go on a kindle cover I’m planing on knitting in the same yarn and pattern. Matching accessories for the win! 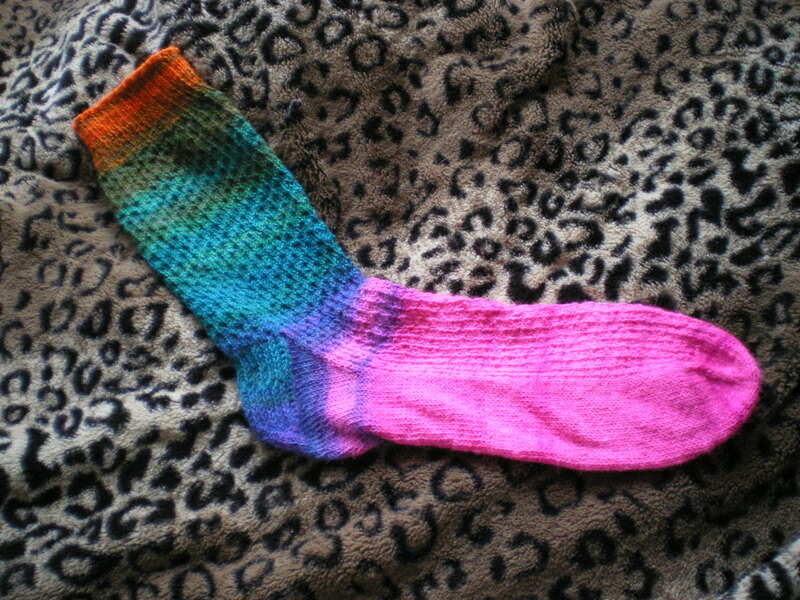 I also finished a sock! Go me! I’ve already started the next one, but since there isn’t much more than the toe at the moment, I didn’t bother taking a picture of that. That brings me onto the (slightly naughty) stash enhancement which has been going on up here. Firstly, there was a skein of laceweight which I’m going to double up to make a Glitz shawl (available on knitty). Now, that of course means I need the beads to go with it, so I ordered those online. I’m looking forward to getting them (isn’t getting post such fun? ), but that does mean there isn’t a picture of them yet. Unfortunately, I probably won’t start it anytime soon, anyway, just because I’ve got so much other stuff I want to make! I also bought some more sock yarn whilst in town on Wednesday. I know, I really didn’t need to, but I walked into a yarn shop and it jumped at me and refused to let go. 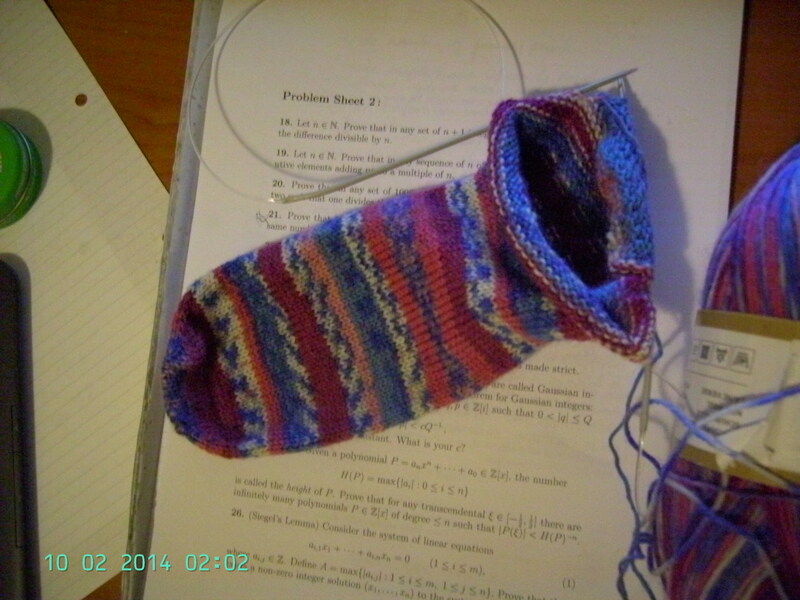 I’m thinking just a pair of plain socks in this, or maybe the jaywalker pattern that everyone loves…I’m thinking vanilla. The only downside I can see to all this knitting loveliness is that the cross stitching is suffering 😦 I can’t remember the last time I picked up a sewing needle, which is a bit of a shame…then I look at all the lovely things I’m knitting and feel better. If only it didn’t take so long to start! Maybe it’s something to concentrate on next week. What stash enhancement have you done recently? Currently I have two pairs of socks on the go, one for me, and another pair for a housemate, who spins. He gave me the yarn before Christmas! I may have gotten slightly side-tracked by Christmas and my top, and, and… well, anyway. 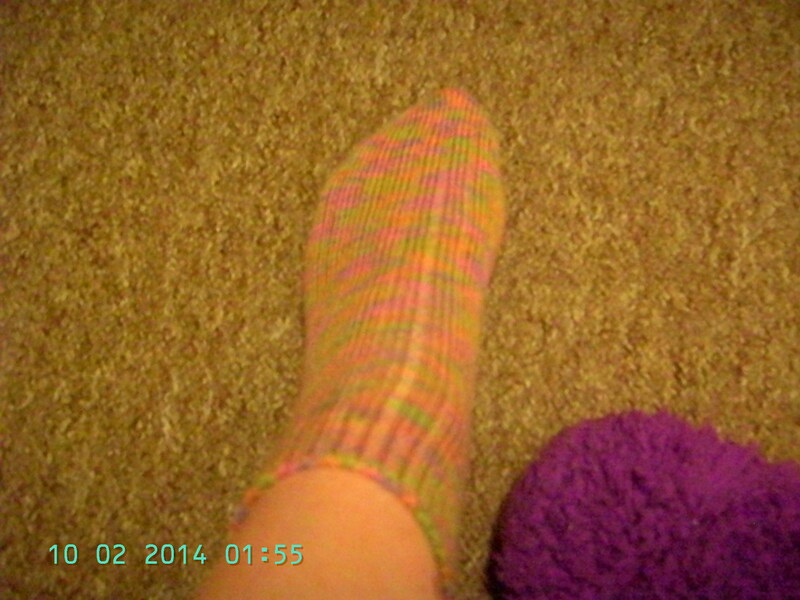 The first sock is now finished, and wowsa it’s big! 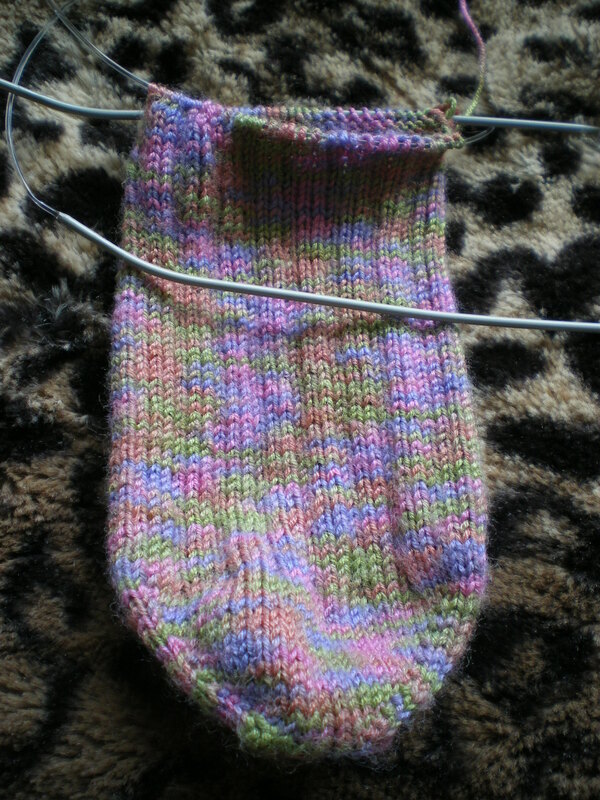 And I only have 2 more inches or thereabout before I start the heel! 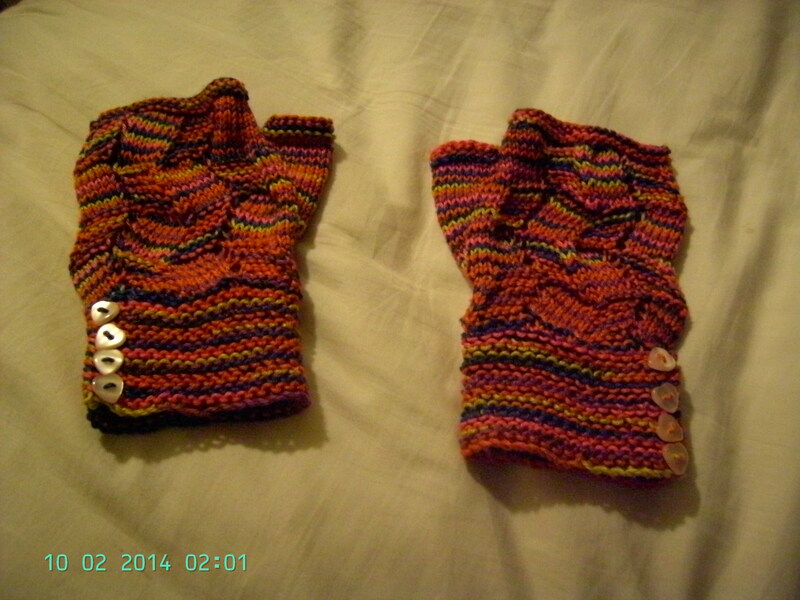 Massively smaller, and therefore quicker (mostly, I am using smaller needles too). I’m sure that if these socks are as smooshy to wear as they are to knit, I will be wanting lots of Wendy Happy yarn in the future for my socks, it’s divine! It’s difficult to tell from this photo, but the yarn has a thread of sparkle running through. It’s an absolute dream to knit with, this yarn, too. It’s King Cole Glitz, and by smooshing it you really couldn’t tell that it’s 97% acrylic! 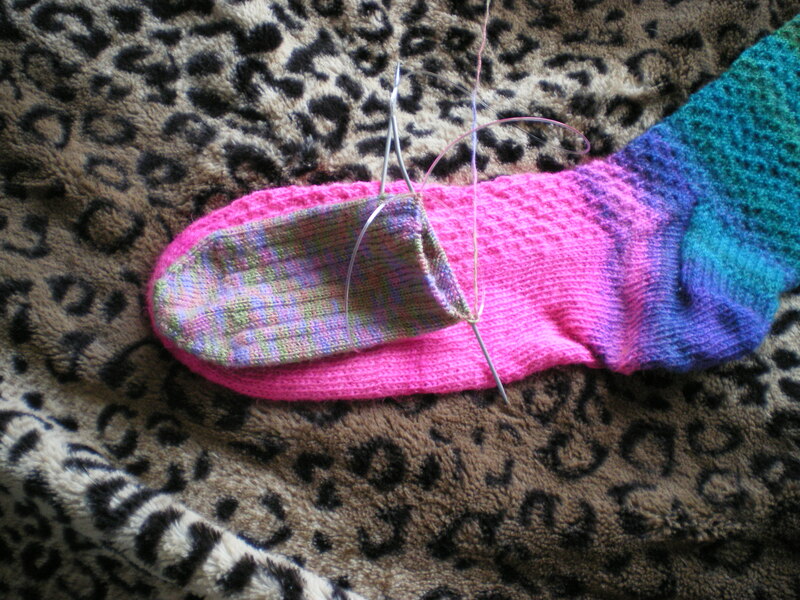 It feels only slightly rougher than the bamboo I’m making the socks from! 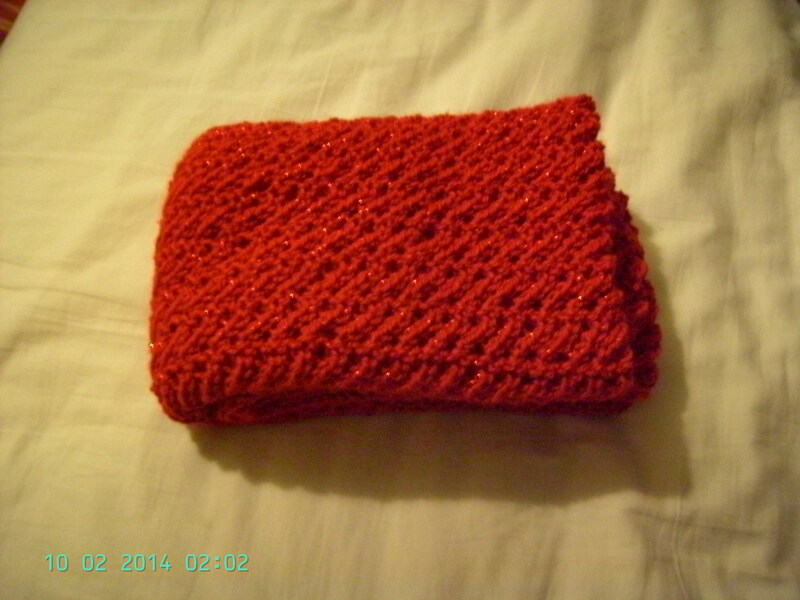 Wow, I’ve been busy knitting! The only downside to which is that I haven’t done any cross stitch. But hey ho, I craft because I want to, so it’s all good. 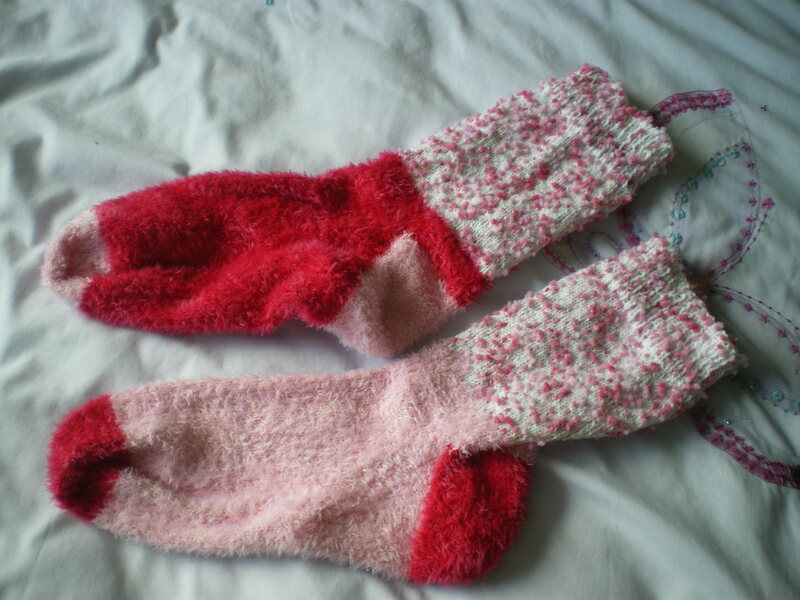 After all, who can be sad with hand-knit socks? 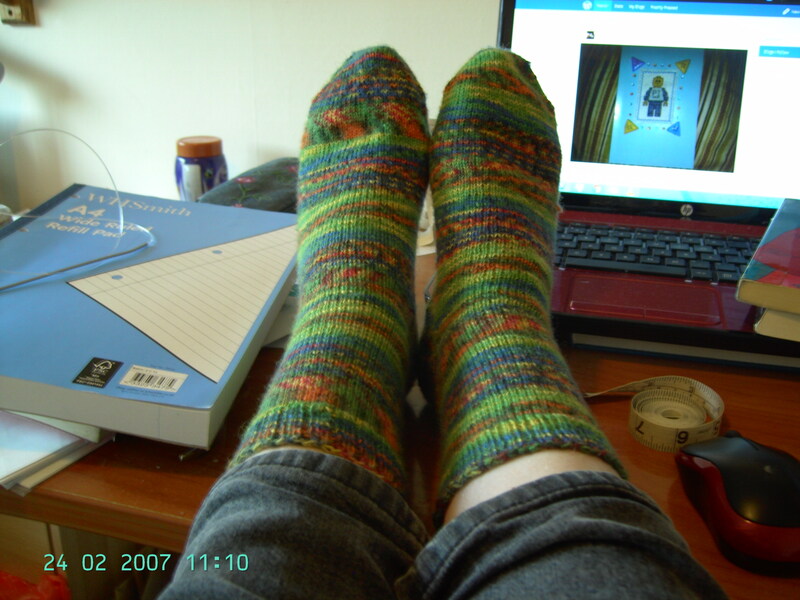 Have you knit any socks recently? So now you can all see the lovely photos of all the things I’ve been doing. Okay, so there’s only been two things. But still, it’s all lovely. The amount I have left to do took me about a week for the other side. This mean that I’ve squished 7 weeks work for the right hand side into 3 weeks work on the left hand side. and I don’t even like the left hand side! I much prefer working patterns left to right, which is crazy, because knitting charts are more often right to left than left to right… *shrugs* I’m not gonna complain, especially if it means this is ready before Uni starts, rather than having to be put onto a back burner until all my Christmas presents are done. I did take a couple of days out to work on my Grandpa’s birthday card, since his birthday is at the beginning of October, and I think he’s going away, so I need to finish it up and get it in the post pronto! 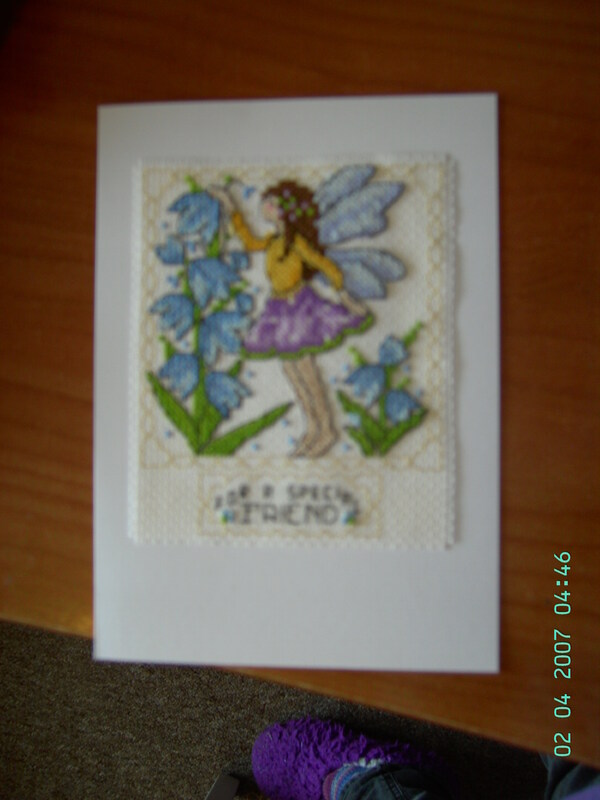 The main fairy was really nice to do, and the backstitch wasn’t as painful as I thought it was going to be. 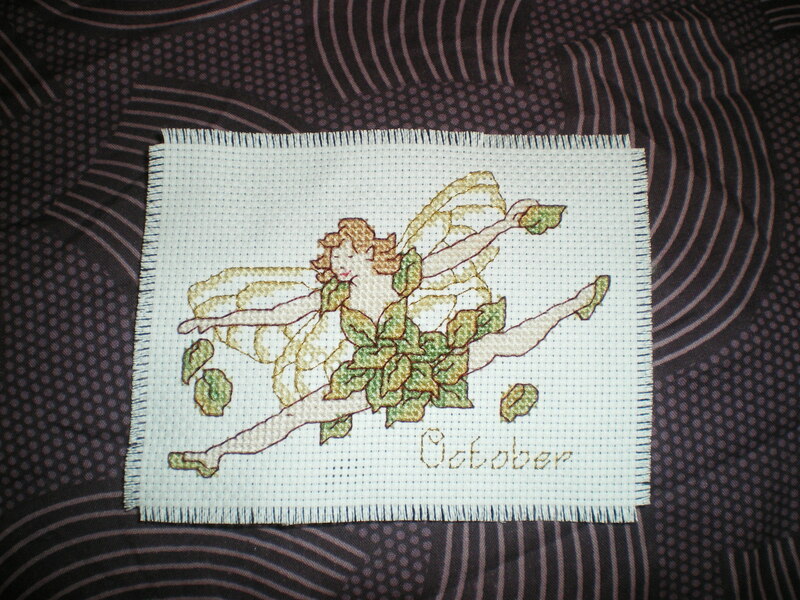 I had to keep repeating to myself ‘backstitch is nice, backstitch is your friend’, especially when it got to the metallic thread for her wings and October, but it really worked! It probably helped that most of it was straight lines from one hole to another, rather than that randomness of ‘the thread will go through here, even though it’s about a third of the way up and some way along, so it’s really hard to make the lines line up’. There was a bit of that for her face, but even that was relatively nice. I really liked this fairy, and want to do the entire set now! And ideas on framing them??? Well, I think that’s everything for now (isn’t cross stitch monogamy such a bore for all my readers 😛 ). I did see a wonderful idea for a cross stitch rotation, where each cross stitch piece was given a week, and then sent to the back of the queue again; is this a common thing? Or do people prefer working on one thing at a time, and being able to remember where you were up to? If you do work on more than one thing at a time, how do you remember where you’re up to, or is it just a skill that comes with time? Okay, that is me done for now, probably talk to you all next Saturday, when (fingers crossed, eh? 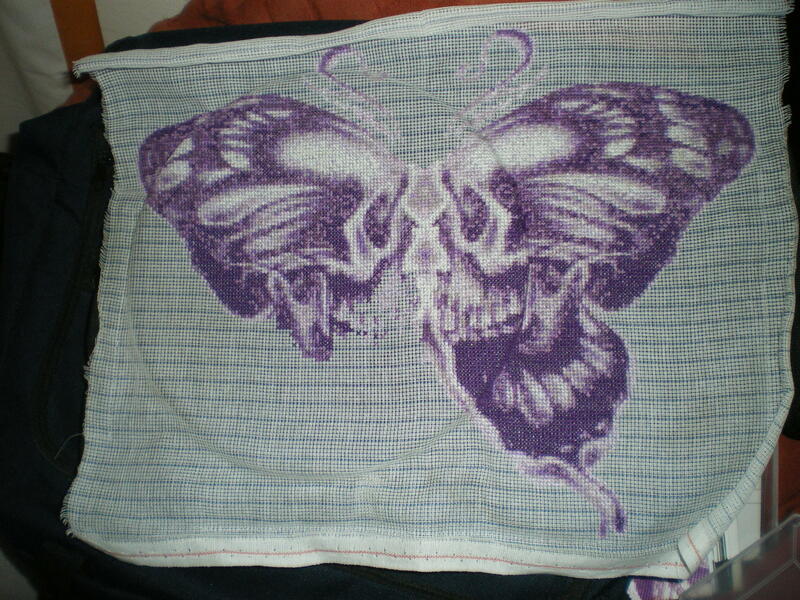 ), my butterfly will be cross stitched, washed and de-wastefied. See ya then! 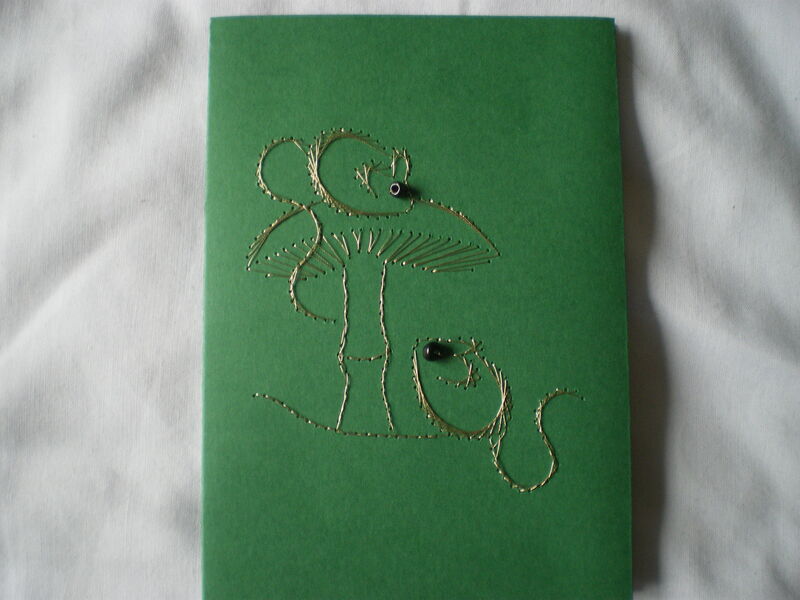 That toadstool was such good fun to make, I’m glad that this was the design that had 4 cards made of it! And, on top of all that, I’ve carried on making socks(I may have ruined a pair on the washing line…), but they haven’t been photographed (I was far too eager to get them on my feet! 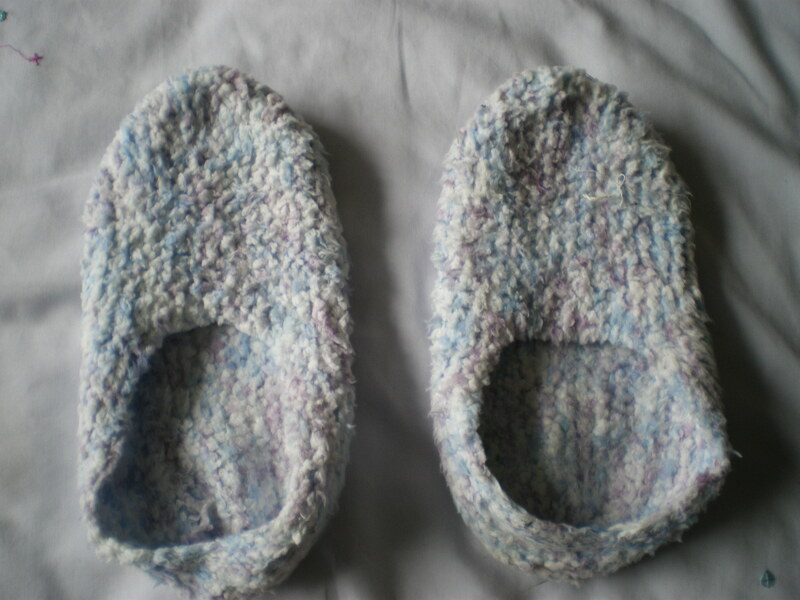 ), so when I finish the next pair I’ll try to photograph them before putting them on! So that’s where I’ve been the last few days. And when I haven’t been crafting, I’ve been organising all my crafting things, and finding lots of other things to do. Why is there never enough time in the day?